Your desk is the staple of your business. It's the depot of your home office too. 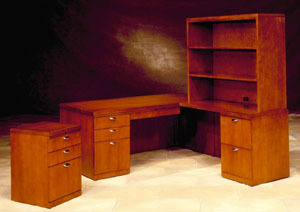 We can outfit any office with the right desk at the right price. We do it every day. With modular workstations, you can gather the best of storage and space to maximize your floor space and workspace, to give yourself the best efficiency in workflow and time management. L-Shape Desks can be left or right sided and are available in all styles, contemporary, classic traditional, transitional, wood or laminate, and in many finishes too. Visit our showroom for complete details and styles and selections available today. Or view our L-Shape Desk idea pages for some more concepts. We also do semi-custom design work. U-Shape Desks can be left or right sided and are available in all styles, contemporary, classic traditional, transitional, wood or laminate, and in many finishes too. Visit our showroom for complete details and styles and selections available today. Or view our U-Shape Desk idea pages for some more concepts. We also do semi-custom design work. 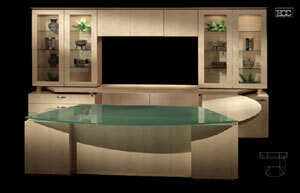 To whet your appetite to visit our showroom and order that perfect desk for you! 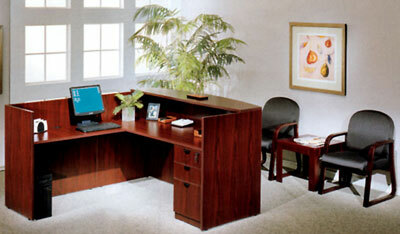 "L"-ementary — L-Shaped desks and workstations are a very popular office workspace tool. With a broad variety of styles, sizes and finishes, there's an L-desk in your future. 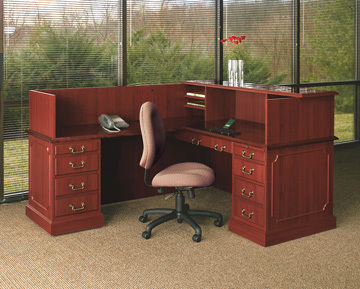 Visit our showroom for our complete selection of desks and workstations. 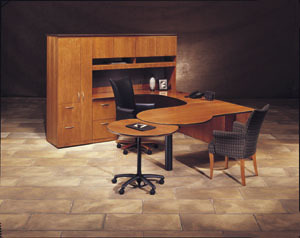 We have desks in wood and laminate series, and semi-custom designs too. With your floor plan or office space dimensions in hand, you can work with our professional sales team to configure the perfect office desk workstation for your own office or to outfit your entire office floor today. 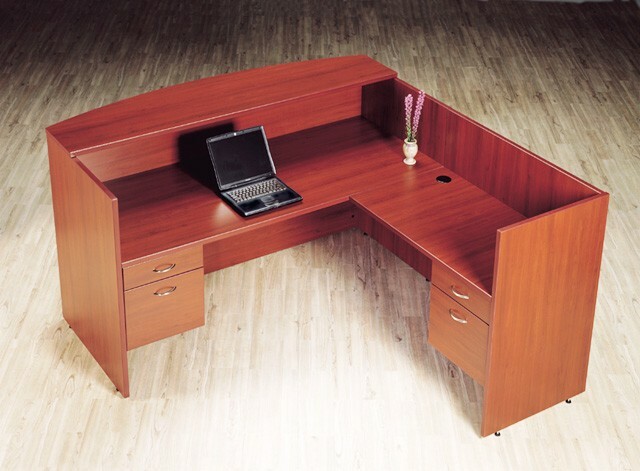 L shaped desks are available "left" and "right" sided in various sizes and styles. Different storage options too. It's a matter of style, and available office size. Visit our showroom for complete details on available options, styles, colors and sizes. We have on our floor, traditional, contemporary and budget selections, in L and U-Shape and other layouts to suit your perfect office suite and budget. Visit our Huge New York Showroom for current selection and styles available for your home or office workspace today. 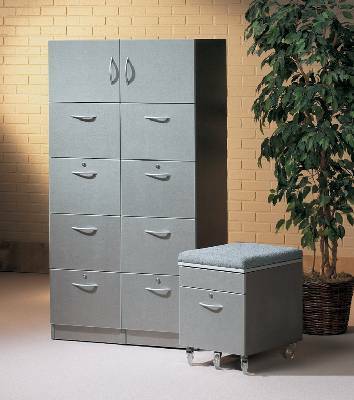 Mobile Pedestals are under-desk drawers that have wheels enabling you to move and place them where you like. A useful option for when you want it, but not available for every desk. Typically more expensive than fixed drawers. Two Tone Color is a style feature some people like for the contrast, though often a blend of colors can mix well with a variety of home or office decors. 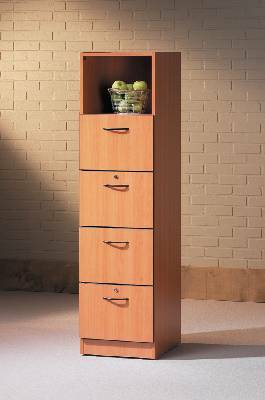 Workstation with Hutch is a popular theme, given that using vertical space for storage frees up or augments any floor-standing or under-desk storage units. 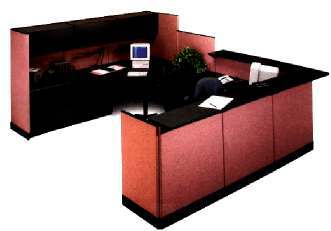 Modular Units are those which are comprised of elements, or modules, which can be arranged to suit a particular desk or workstation combination. 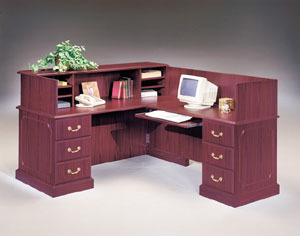 Computer Desk is a general term for a desk suitable for housing or using a computer. Many may offer features such as a keyboard tray, wire management, computer tower storage or video monitor housing. Computer Keyboard tray is a useful addition to a desk when a center drawer is not needed and desk space may be conserved to provide a pull-out shelf for the keyboard unit. These may be installed on straight or L desks as well as on corner desks too. 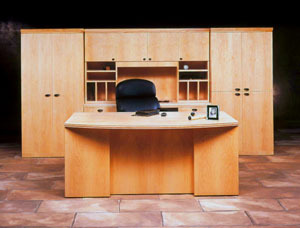 L-Shape Desk is one which forms the shape of an L )when viewed from above) and most often is deeper on the desk side and narrower on the return side. When the return is on the user's right, it is a right return. A left return is when the L bends to the user's left. Custom Configuration? Sometimes you have specific space needs that a popular desk size cannot accomodate. Bring us your space measurements, floor plan, or homemade pencil sketch. We'll do the rest. 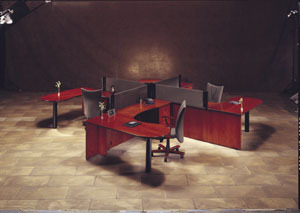 Corner Workstation differs from an L-shape desk in that typically the left and right sections are symmetrial from the user's perspective and are also of equal depth. Very popular for computer use as the computer can occupy the deeper part of the corner while leaving the rest of the desk surfaces free for papers, books and other materials. 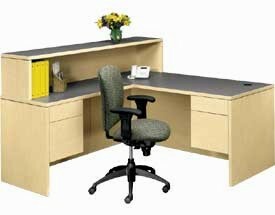 Corner Workstation can be built up with additional components to make a desk into a real office. Choose the Best Workstation for "U"
Make the statement that is "U" — a U-Shaped workstation maximizes worksurface area and gives you the convenience of your office storage within easy reach. We carry a variety of workstations for your personal style - whether a traditional desk series is for you, or something more contemporary, it's your U! 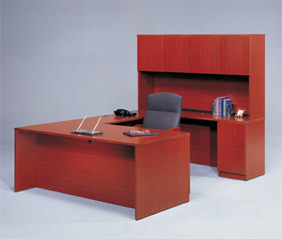 Workstations are available in wood series and laminate series in different colors and finishes. Make your selection to suit your available office space. 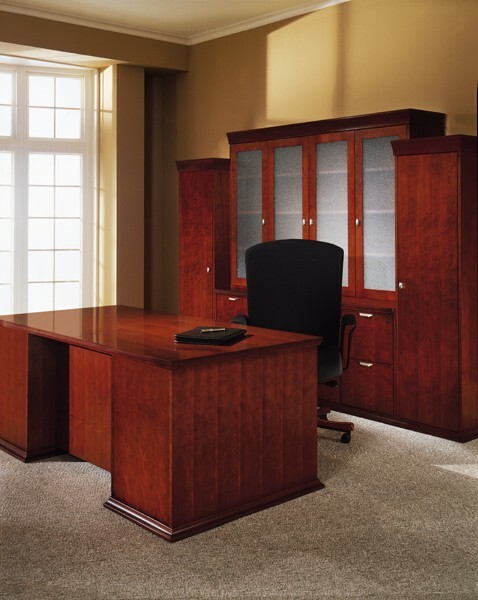 Bring in your floor plan or office space dimensions and work with our professional sales team to assemble the perfect workstation for your private office or corporate suite today. There's no one way to make a U - they're available "left" and "right" sided in various sizes and styles. Different storage options too. It's a matter of style, and available office size. Visit our showroom for complete details on available options, styles, colors and sizes. Who's the Boss? You work hard to keep things running. Make sure your workspace suits your environment. 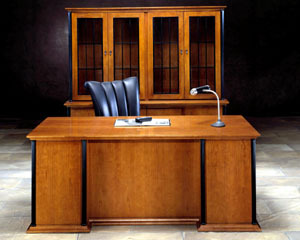 Do you have the desk size you need for your paperwork, or your presentations? 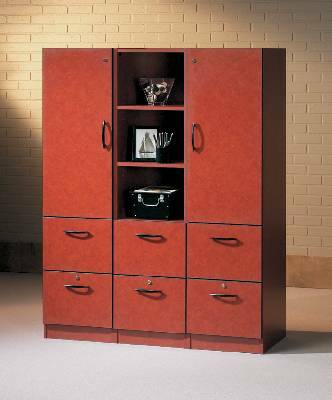 What kind of storage or cabinets work best for you? Bring in your sketch or ideas for what you need and we can make it happen for you. 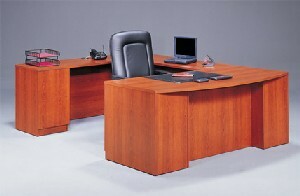 We carry an arsenal of executive desks for all budgets and office space needs. Whether your suiting up a new satellite office, or relocating to a new main location, we're always there for you, every step of the way. Bring in your floor plan or space dimensions, we will work with you to outfit the areas you need most, whether it's your new conference room table, setting up a file storage room, or dressing up a new waiting room with stylish receptionist desk. We can do that too, and more. Our website is a very small preview of the kind and quality of products available. From budget cubicles to executive wood office suites, we can do the best job we can do — to make your workspace go from bland to beautiful. And within budget! We're here for YOU, New York. And have been for decades. That's why we're proud of our loyal customers and repeat and referal clients. Let us know YOU'RE here, and let us take care of YOU. We pride ourselves in getting repeat business and referrals. We take care of you because your business matters to us. Office Furniture is our name. We don't sell glue or staples. 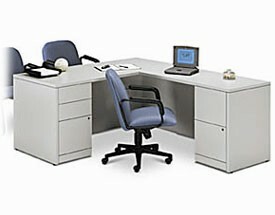 We sell Desks and Chairs that work hard for you so you can focus on getting your work done, with no problems. Our quality reception desks are the flagship of so many area businesses, it's hard to imagine you haven't already been impressed with our work all over the New York metropolitan area and all Long Island, Nassau and Suffolk Counties alike. 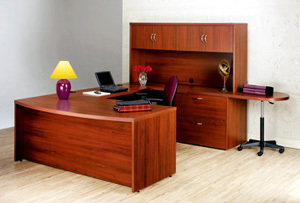 Become a member of BiNA Office Furniture pride and purchase your reception desks and office suites from us. You'll be glad you did, because you're in good company, with our company, and the countless other area executives who cherish the promises we've delivered to them, year after year. 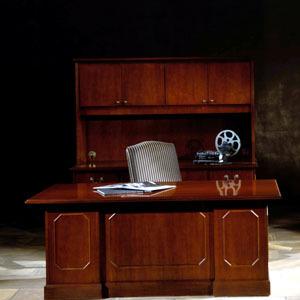 We invite you to visit OUR reception room, and experience all the glamour of plain and simple office furniture quality. 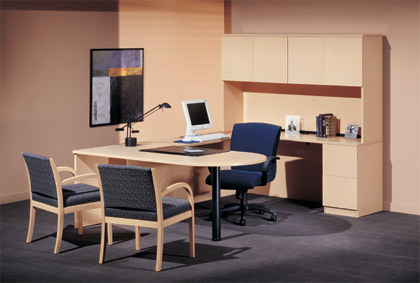 From reception room desk and waiting room chairs, to private offices and office cubicles alike. We're there every step of the way. Give us a chance to impress you with the quality and style of the products we deliver and setup every day to New York merchants, medical offices and more. We know you'll be back for more. 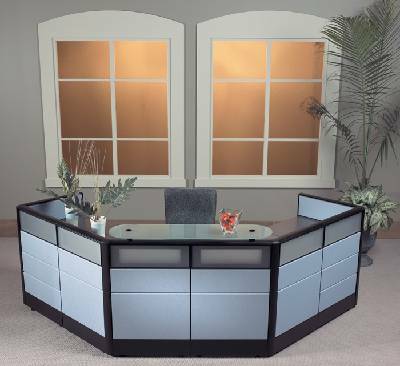 L-Shaped Reception Desk provides maximal desk space and is best suited for traffic management to visitors who must greet with receptionist prior to gaining access to your facility. 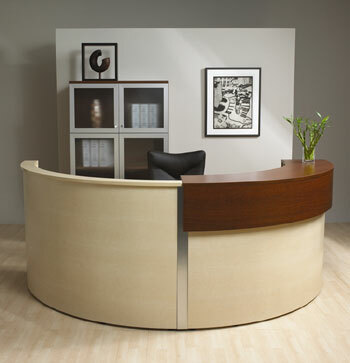 Semi-Sphere Reception Desk represents elegance and luxury with gentle curves and ample presence to your guests. 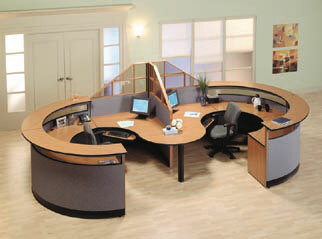 Curved Corner Transaction Top gives an open airy feel to a large reception area. Traditional Executive Reception speaks to classic styling and long-standing precent. 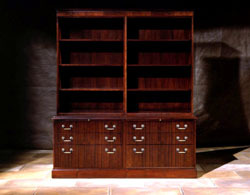 Traditional Receptionist Desk can offer a proper polish to your classic tastes. 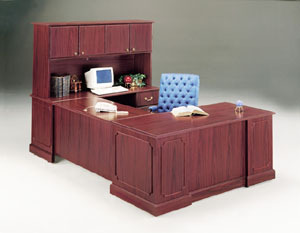 Mahogany Finish is a popular decor in office furniture today. Visit our showroom for our complete selection of styles, colors, finishes that will suit YOUR budget and office space needs, New York! Available in 30 Colors, and two-tone available. Trim, handles, cabinets and more. We can get you what you need, New York; be our showroom guest and see how! Let Us Help You Design the Perfect Reception Room. 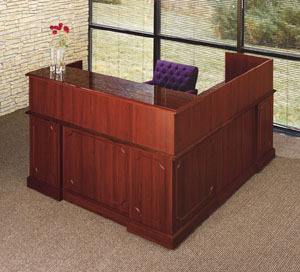 Starting with your reception desk and guest room seating, we can help you build out your new space or upgrade your old. Either way, your workplace will hum and flow to the new workspace YOU'VE created at Bina Office Furniture, Long Island NY. Practical Workspace Design for Any Office. 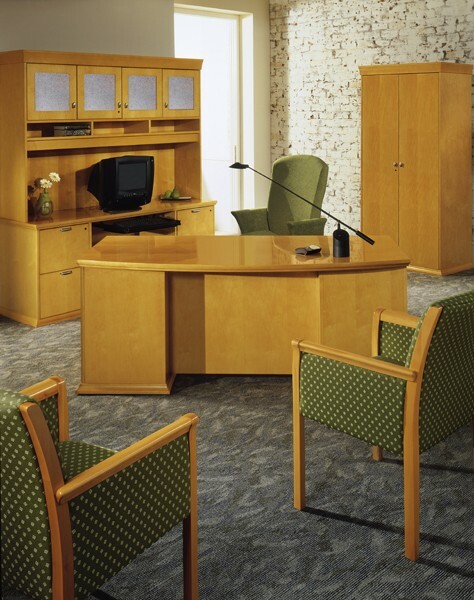 We've been doing this for decades so you won't have to spend days choosing your office space furniture. You've got work to do! Let us do OUR job, so you can do YOURS. Visit us today. 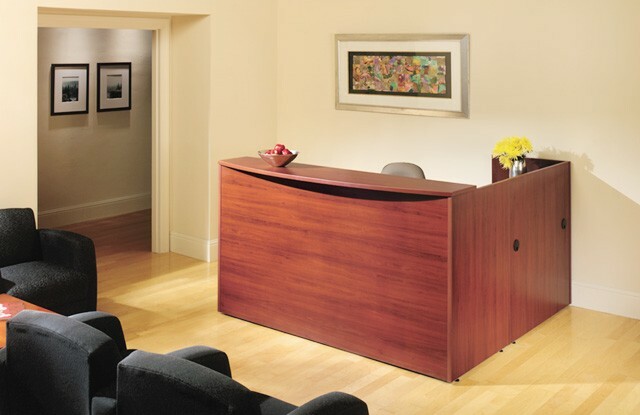 L-Shape Bow Reception gives you some curve to a rectangular L. A reception desk is available in the size you need — bring us your floorplan or ad-hoc measurements, we'll do the rest. We Can Do It. No job is too big or too small. We've provided office furniture to the greater New York Metropolitan area for decades, to all business large and small, startups, home offices, and established practices and corporations alike. Let Us Know Your Space Size and Budget. We'll give you best practices and options for your requirements and nothing else for you to do but say "YES!" to BiNA Office Furniture in New York. We'll Build You the Perfect Reception Unit for the custom space requirements you need. Or take from our vast showroom selection of styles and options. You'll be glad you did. Bring in Your Floor Plan & let us know what you need to do so we can help make you happy! As the saying goes, you only get once chance to make a first impression. Your clients, customers or patients will quite often only spend time in your waiting room before they even meet you. Give yourself that best-dressed look and make your guests feel comfortable as they are here to visit and meet you and your staff. Visit our showroom for a complete review of our reception desks and waiting room furniture, including coffee and end tables, matching guest chairs, magazine racks and more. Please do let us know the area you're looking to utilize for your waiting room or reception desk. 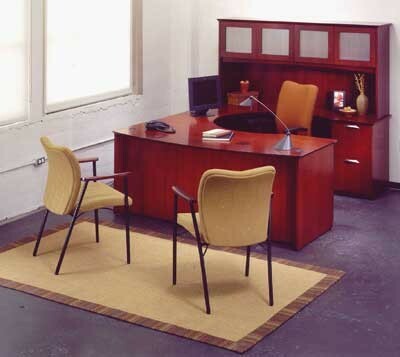 We'll then be able to help you make a prompt selection of best options for your space and office purpose. You don't have to spend a fortune to look like a million bucks. View our quality selection and choose the right look and style for your space. We're able to recommend for every office budget and business type. 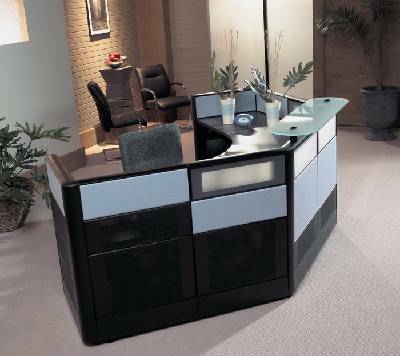 Reception Desks are an integral part of your office appearance and core functionality. Providing a physical space and barrier to visitors manages traffic flow and indicates authority for access to your facility. What Shape is Your Parachute? Desks come in all shapes and sizes. That's because we all work differently and want our desk to serve many different roles in our business. Likewise for any desk family, there are different varieties that alter the style and offer additional utility to the workspace. One of our most popular styles is the L-Shape Desk, which as the name indicates, forms and L shape with the desk and the return, which can be either on the left or right side. Thus you have a left or right L-shape desk. Both the desk and return can be in different widths and depths, so it's best to know your available floor space to ensure maximum use of your work area. 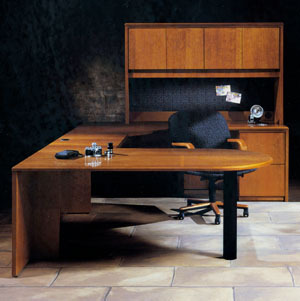 The U-Shape Desk is in essence an extended L desk with another worksurface. 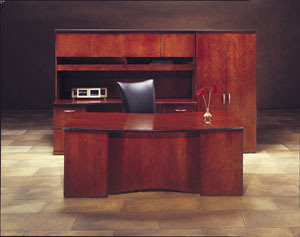 It can also be viewed as a desk and credenza with a connecting bridge forming the base of the U. This style is very popular due to this very fact — as it simply provides additional desktop working space to a conventional office desk and credenza arrangement. The incursion of personal computers into the home gave rise to the computer desk in home offices, with a myriad of alien styling attempting to give a high-tech look, but we find today, most home offices are seeking a more legitimate office desk solution and are favoring more standard home office furniture. 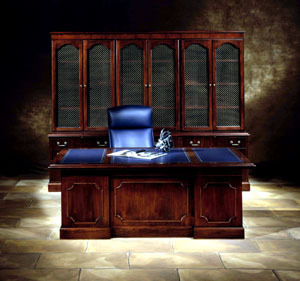 For a complete selection of office furniture in New York, you can't beat our showroom. It's the most complete office furniture showroom in Long Island, and our experienced sales team can quickly and easily help you choose the right desk for your business, budget and available office space. DO note location of windows, outlets, radiators, etc. 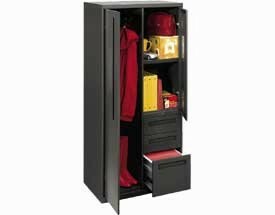 DO consider how much storage you need, for filing cabinets, bookcases, work materials, etc. DO bring your notes with you, we'll get you just what you needed! Browse Workstations, Desks, Hutches, Wall Hutch, Bookcase Hutch, CPU Holder, Keyboard Tray and more at our huge 30,000 square foot office furniture showroom. Call 516-248-5858 or visit our showroom today! 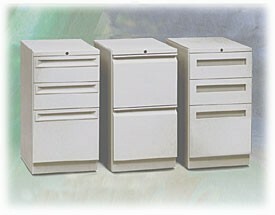 We sell new and used lateral file cabinets in many sizes. Suitable for letter and legal size filing. 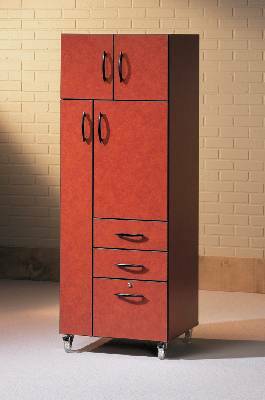 Buy our heavy duty metal file cabinets today. 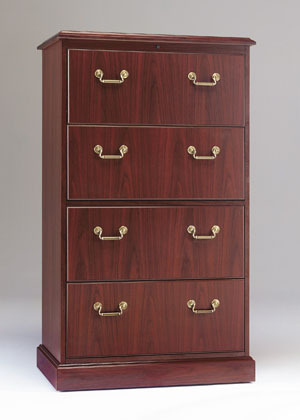 We also carry medical patient and x-ray filing, and solutions for Redwells and other storage needs..
Visit our showroom for selection of elegant traditional file cabinets and office furniture suites. 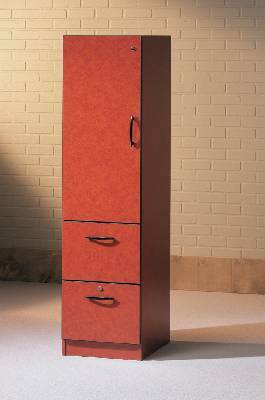 Complete your office space with our workstation solutions including our matching laminate file cabinets in different finishes. 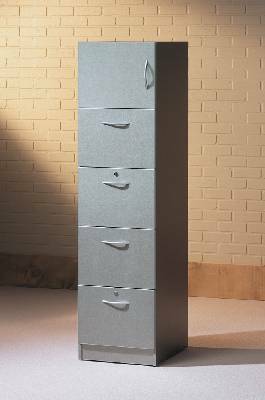 Order a new metal vertical file for either letter or legal filing. Available in gray, putty or black. 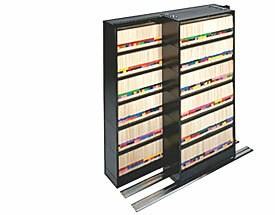 Maximize your file storage area with a high-density sliding track filing system. We can add on more tracks and filing as you grow! Let us know what documents you are storing. 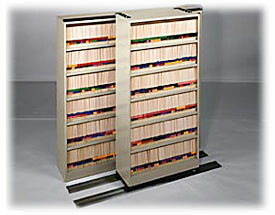 High density filing available for different document sizes, unit widths and heights and with or without doors. 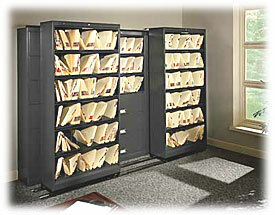 Four drawer traditional office legal file cabinet. Don't see it? 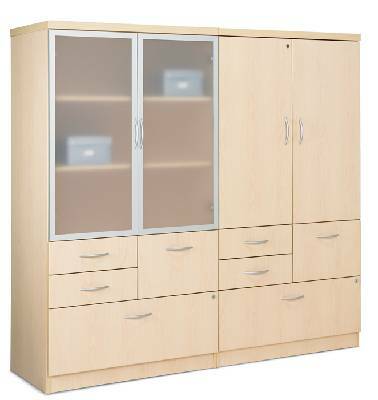 We can do semi-custom storage cabinets too. 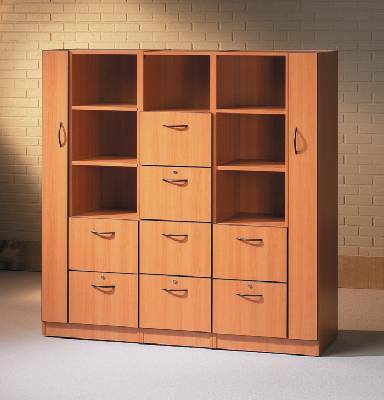 or combine several of our standard units to suit your office storage needs. 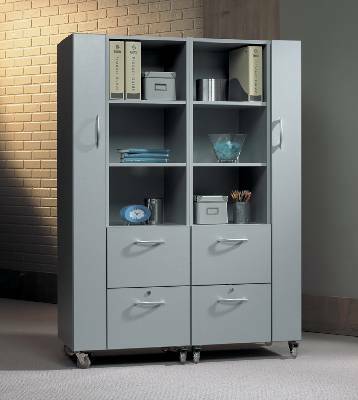 Lateral file cabinet with bookcase upper available in different combinations. Shown here as 2 drawers with 3 shelves. You can cover the bookcase portion with a door too. Choose frosted doors for modern high-tech appeal. Mix and match frosted doors with solid ones to provide the design and function you seek. We offer professional fleet setup and installation on all products we sell. Bring us your project dimensions, choose your colors, then relax. We do the rest. Visit our showroom for complete selection and information on what you need today. Directions to our NY Showroom for complete selection of storage units for all office furniture needs. Examples of bookcases to inspire you; Visit our Long Island New York Showroom for complete selection and details. 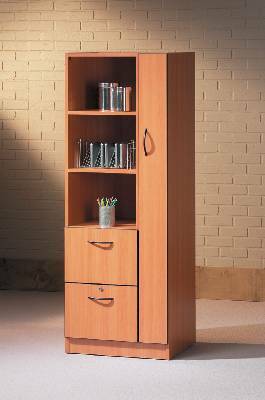 We carry high quality laminate and wood bookcases for your home office or business library. Call 516-248-5966 or visit our huge office furniture showroom today! 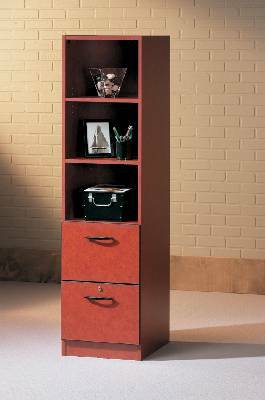 We carry a wide assortment of bookcases and shelving for your office, including wall hanging units, steel shelving, wood bookshelves and more. Choose your style and color preference, to match existing decor or build a new ensemble today. 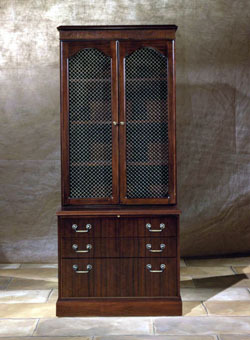 Traditional Styled Bookcase Hutch and Lateral File Cabinet. Traditional styling is a timeless classic, with brass handles and subtle trim for a very elegant look. 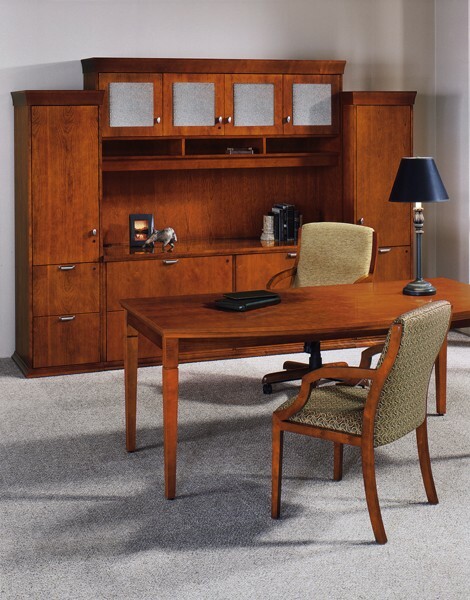 Visit our showroom for our display of traditional office furniture for your home or business workplace. 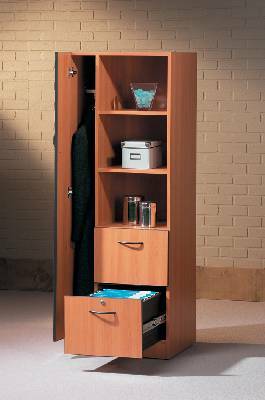 Assemble an array of bookshelves with or without doors for a visually appealing line-up, along with the facility for closed storage below. 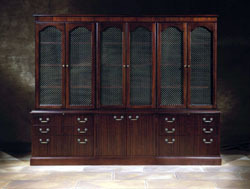 Executive elegance is achieved with glass doors adorning the bookcase. Not available on all styles, yet surely a elegant touch when you want to make that statement, or to keep your treasured collection dust-free. Measure your office space to know what size shelving works best for your space. Watch for windows and radiators, and also consider the weight of the books, and if you want a solid or masonite back. 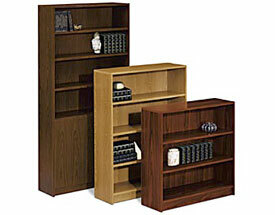 Wood veneer bookcases available in different finishes, with or without trim kit, or optional door kit. Visit our showroom for more ideas and space planning for your library. 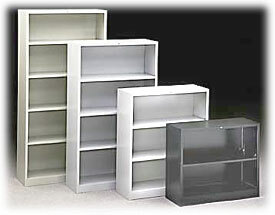 We also carry shelving units and high-density filing for bulk volume of documents, case files and HIPAA patient files. 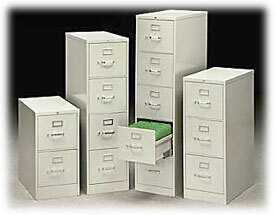 We carry a range of file cabinets and storage units for your office documents and important items. 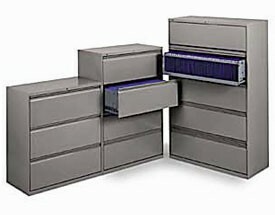 Choose from lateral file cabinets to vertical filing, as well as high-density filing solutions for your medical office HIPAA patient files, or legal practice document Redwell folders. How Much Floor Space You Have To Store It! Bookshelves for your office are an inevitable essential item. 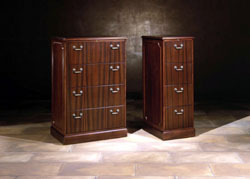 Select one to match your executive suite, or buy a basic one to provide shelf storage. 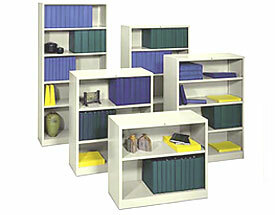 Durable laminate shelves provide easy access to your personal or professional library. 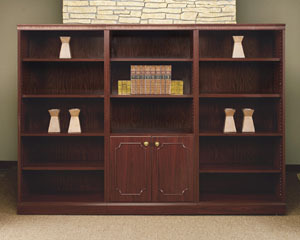 Wood bookshelves provide the added elegance to suit your style and decor. 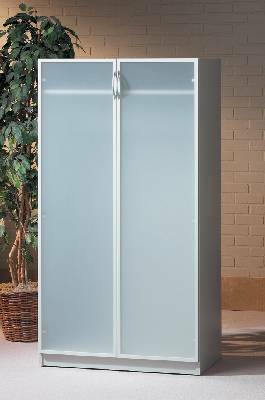 Glass or wood doors are available on some units to provide additional design and functionality. 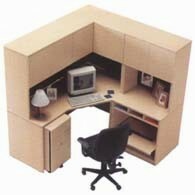 Why buy Herman Miller used cubicles? 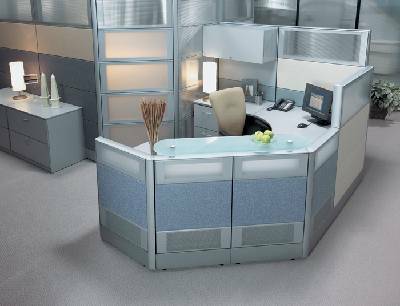 Why Buy Used Herman Miller Cubicles? You don't have to buy Herman Miller used cubicles, when you can buy our lookalikes NEW for a lot less! 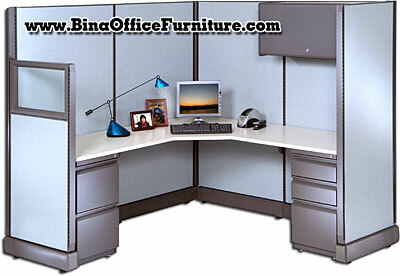 At Bina Office Furniture — You can have have our quality budget office cubicle design in your office.. NEW! 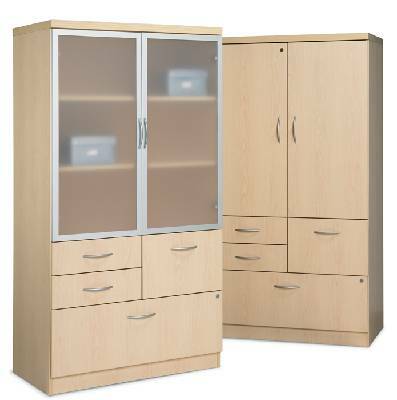 Choose from our in-stock program and get your cubicles quickly and affordably. Bring in your office floor plan or give us the general space requirements you are working with, we can help you pull together your cubicle office plan quickly and easily. 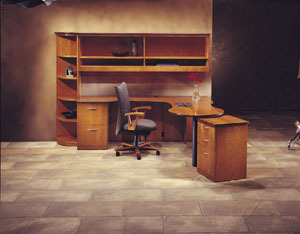 View our floor models and color samples. Select your styles and features. Work with our expert sales team to build the office you need and you can even rely on our own professional fleet installers to deliver and setup your cubicle or office desk layout for you. That's the Bina Office Furniture cubicle program!